Many serious thinkers have concluded from the existence of massive evil and suffering that there probably isn’t a good god overseeing the Cosmos. Most believers can’t go that far, and reach for other explanations. Hence one mourner in Dunblane chose the metaphor of oversleeping to excuse God’s inattention. This metaphor is milder than Nietzsche’s famous declaration that “God is dead,” but “God overslept” is still just an attempt—tinged with cynicism it seems to me—to come to terms with God’s absence or indifference. Why didn’t God—almighty God who knows if even a sparrow falls to the ground (Matt. 10:29)—jam the gun that day? Sounds so simple, doesn’t it? God could have jammed the gun. Why not? But even many Christians would respond, “Well, the world doesn’t work that way.” Of course not. But why not, if “he’s got the whole world in his hands”? The disconnect between such sentimental religious banalities and the real world can be very jarring. With so much evil and misery on this planet, how is it consoling, let alone true, that “he’s got the whole world in his hands”? Many explanations have been offered to account for suffering in our tiny corner of a Cosmos supposedly supervised by a caring and all-powerful god. The result of this major theistic preoccupation can be labeled The Litany of Excuses (although it’s officially called theodicy). Most Christian laypeople can usually round up a few of the standard apologies if asked point-blank why God tolerates so much evil and suffering. Secular philosophers understand that the excuses don’t hold water—that’s commonly why they became secular philosophers—and theologians differ as to which are worth clinging to, and offer strained and forced defenses of those that they prefer. 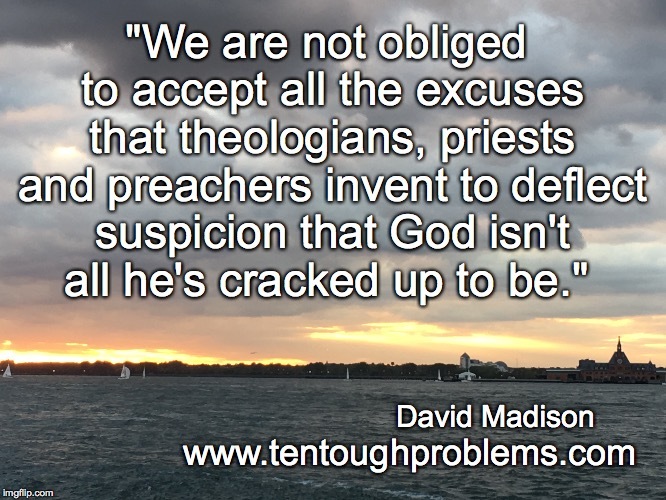 David Madison was a pastor in the United Methodist Church for nine years, and has a PhD in Biblical Studies from Boston University. 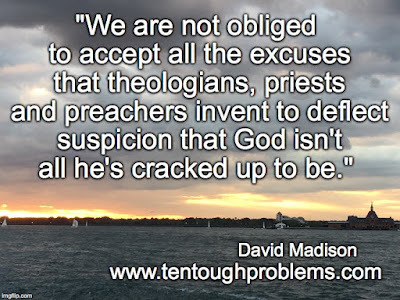 His book, Ten Tough Problems in Christian Thought and Belief: a Minister-Turned-Atheist Shows Why You Should Ditch the Faith, was published by Tellectual Press in August 2016.